TORONTO (July 19) — The prevailing response to the Raptors trading DeMar DeRozan this week was so Toronto. The city that has hardly ever known prosperity among its major sports teams went all mushy. “Poor, mistreated” DeMar has to take his paltry, five–year, $139 million contract (or $27,739,975 per season) from a team that has never played in the National Basketball Association finals to a club with six NBA championships since 1999. Honestly, I’ve heard of defilement and abuse in my day, but nothing as heinous as exiling DeRozan to an outpost like San Antonio. How could the Raptors so cruelly desecrate a man that “led” them to a humiliating romp by Cleveland in Round 2 of the Larry O’Brien sweepstakes this spring; a four–game destruction that ended with the most lop–sided score (128–93) against any No. 1 playoff seed in history? Why, if DeMar had contributed anything more to the cause, they’d have started a Raptors’ version of Legends Row outside Scotiabank Arena. As it is, the wounded man must now shuffle off to one of the great franchises in the modern NBA. No wonder our city erupted in such an outcry of empathy and condolence. The ‘best player’ in franchise history is gone” (Sean Whittle obviously never watched Vince Carter). “I’m done with the Raptors” lamented Viktor Gergo. “[DeMar] made the city proud” claimed Simon Miller, having clearly missed Game 4 against Cleveland. Yup, folks, imagine the gall of Masai Ujiri pulling off a bold move to try and actually win something. Admittedly, that’s a foreign concept to sports fans in our city; young and old. It’s no wonder they reacted with such bewilderment to a necessary move. This is a town that has tolerated; in fact embraced deficiency with its most–popular team — the Leafs — for as long as most can remember. Basketball zealots were plummeting into the same canyon until Ujiri decided to break the mold. They answered by running for boxes of Kleenex. Ignorance may be bliss, but not with pro sports mediocrity. At least, it shouldn’t be. Winning; the notion of actually coming out on top, has been such a pipe–dream for fans of Toronto’s three primary sports clubs (Leafs, Raptors, Blue Jays) that even trivial accomplishment is extolled. The Leafs get eliminated in a rout by Boston… but, hey, they made it to Game 7. The Blue Jays appear in the playoffs twice in 25 years and baseball’s worst venue is routinely packed. The Raptors are decimated by the Cleveland Cavaliers and anguish erupts when their best player is traded for a better player. You try and figure it out. Throughout the 1970’s and 80’s, a glaring contrast existed between the National Hockey League’s two most–storied franchises. And, their cities. In Montreal, anything less than a Stanley Cup title was considered failure. Here in Toronto, merely scraping into the playoffs engendered glee. Only when the Maple Leafs vaulted into 100–point territory — with Pat Burns and Doug Gilmour in 1993 and ’94; then for more than half–a–decade (1998–2004) under Pat Quinn — did the standard temporarily escalate. Still, the club won absolutely nothing. The Raptors, conceived in 1995, have only once been to the Eastern Conference final (in 2016) when they put up a fight against Cleveland on home court, but were otherwise mauled by LeBron James and Co., losing 115–84, 108–89, 116–78 and 113–87. The point–man of that Toronto massacre? Yup, DeMar DeRozan. The guy being wept out of town. In fact, the only mistake Ujiri has made (up until now) is hanging on to DeMar’s illustrious cohort, Kyle Lowry. 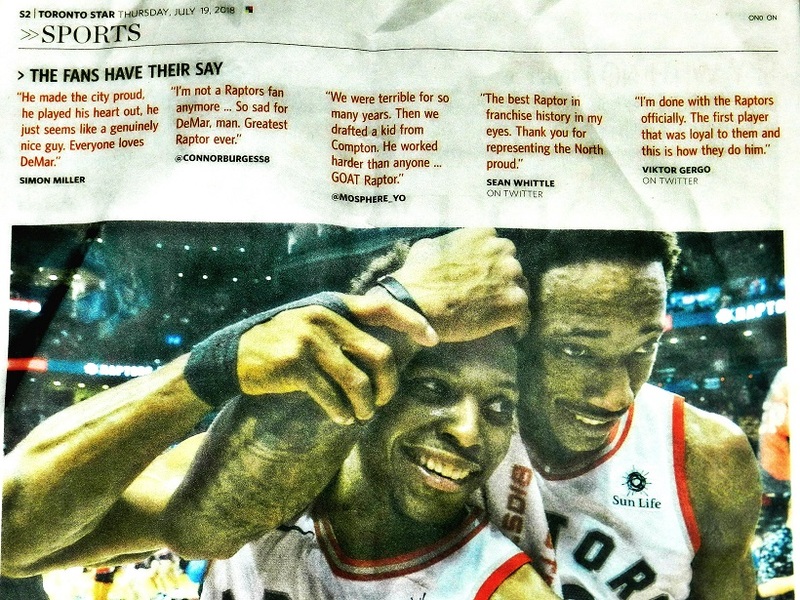 The Raptors’ glorious one–two punch to nowhere. Look, winning just isn’t a Toronto thing. Yes, the Rock, Toronto F.C., the Marlies and football Argonauts have all prevailed; the latter three in the past calendar year. But, who really cares? Until one of the Big 3 cops a championship — the Blue Jays were last to do so, in 1992 and 1993 — nothing in this town will be celebrated. Those that contribute to menial exploit, such as DeMar DeRozan, are lionized beyond reason. Sentimentality, though commendable, is largely pointless in professional sport. Excellent article Howard. You’re right on. As a season ticket holder, it’s about time time. Wake up Toronto.